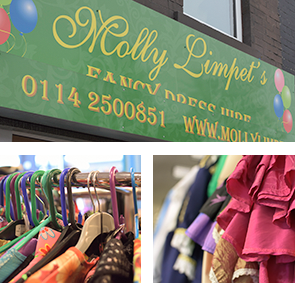 Molly Limpet's is a costume design and manufacturing company, producing garments for either hire or purchase for musical theatre productions, pantomimes, costume parties, Corporate events, Themed Weddings, TV/film projects and magazine and photo shoots. Year on year we keep our quality high and our prices competitive to ensure that our existing customers keep returning, and the numbers of new customers continually growing. Established in 2001, we continue to add to our 30,000+ costume collection, with the most stunning range of costumes that you will see outside of London. Based in Sheffield, we have a shop premises where clients can visit to view and book costumes for private events. Theatre clients are welcome to book by appointment to visit our design Studio, also in Sheffield.